There truly is never a dull moment in the NBA. Here we have several stories from around the league, except one of them is not true. Can you spot it? Dwight Howard is either gay or bi – Dwight Howard has been accused by a man named Masin Elijé of harrassment and threatening with violence. As claimed by Masin, Dwight was dating him and everything was great, until he found out Dwight had been attending orgies with transgenders. So as a result, Masin broke up with him and was going to go public about their relationship. Apparently Dwight’s lackeys offered Masin hush money, but he rejected it. Now who would’ve have thought Dwight was gay, but then when you think about it, he is a pretty well trimmed guy. So maybe it’s not so far-fetched after all. Dwight is currently on the injured list for a recurring lower body injury and has been unable to play for the last few games for the Washington Wizards, who are also at the bottom. Bottom of the league that is. 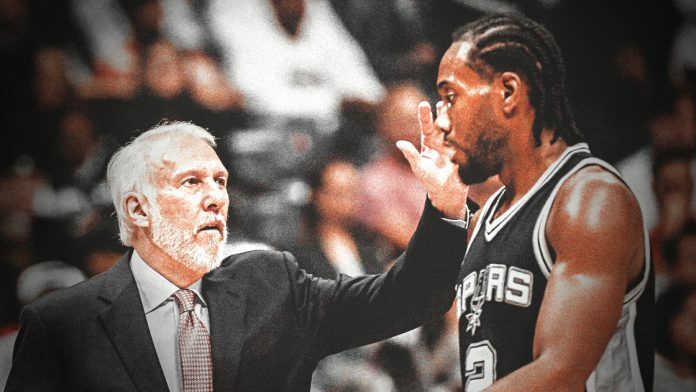 Coach Poppovich still misses Kawhi Leonard – Poppovich during an interview was asked about Leonard’s leadership ability. Poppovich said that Kawhi is an excellent player, but was never a good leader. When Kawhi heard about that, he responded in his usual underwhelming way. He said, “It’s funny to me… I guess he forgot about my leadership when I was playing”. Whatever happened in San Antonio will probably stay in San Antonio. If you ask me, Kawhi doesn’t seem to have a leader type of personality. He’s very quiet, but efficient and deadly like a ninja. So coach is right. He’s not really a leader, but an excellent player. Lakers are about to explode – When you say a team is about to explode you are probably thinking winning streaks. Sadly, this is not the case. The Lakers are about to implode and then maybe explode. LeBron is not happy. Lonzo does not or cannot score consistently and now has rolled his ankle. Coach Luke Walton is being ignored by the King and the King is calling his own plays. There’s a rumor that a trade is needed immediately to fix the situation. I don’t have high hopes for a crappy Lakers team even with the addition of Lebron. The Lakers are like the Cavaliers without LeBron. So it’s not to enough to cut it in this league. Markelle Fultz wants out of Philly – Ever since Butler got traded to the Sixers and took Fultz’s spot in the starting rotation, Fultz has refused to play. Fultz through his agent claims he needs to see another specialist and will not play or practice until then. Not sure what to think here, but Fultz seems upset that Butler has taken his starting spot. Since Fultz refuses to play or even practice, it’s a good indication he wants out as no rookie/sophomore would put out a statement like that. The Sixers need to move on from Fultz. The fact that he is still working on his shot mechanics while being in the NBA means someone failed in the big way. McDonald’s Corp. buys the Denver Nuggets – The Denver Nuggets are changing their name every so slightly – to the Denver McNuggets. This is all due to the claim that some fans are upset that the Nuggets are based on a name that was carved out of oppression. During the gold rush era, many Chinese were “imported” to work the mines since they were known to be efficient and reliable workers and considered cheap labor. They perished under slave like conditions and were generally hated by the whites. Their nickname was the Yellow Peril, which the Nuggets thought was a cool name but decided to stick with the Nuggets. Since McDonald’s bought the team, the board of directors felt the slight name change will appease all the disgruntled fans and at the same time give the corporation even more exposure.